With much of Thaton District now under SPDC control, the villagers living there are regularly called upon to fulfil the unrelenting array of demands for forced labour, building materials, food, and money. The SPDC and the DKBA alike are using the unpaid and forced labour of villagers in the numerous road construction projects that span the district. Dozens of military camps have been built along these roads, further militarizing the region and bringing with it even greater oppression and an increase in the demands and burdens upon the lives of the civilians. Such frequent demands, combined with widespread movement restrictions has limited the amount of food that the villagers are able to produce, resulting in problems with food security to the point where many villagers are unable to sufficiently feed their families. This report examines the situation faced by Karen villagers in Thaton District (known as Doo Tha Htoo in Karen). The district lies in what is officially the northern part of Mon State and also encompasses part of Karen State to the west of the Salween River. Successive Burmese regimes have had strong control over the parts of the district to the west of the Rangoon-Martaban road for many years. They were also able to gain 'defacto' control over the eastern part of the district following the fall of the former Karen National Union (KNU) stronghold at Manerplaw in 1995. The Democratic Karen Buddhist Army (DKBA) is also strong in the district, particularly in the eastern stretches of Pa'an township. Although diminished in recent years, the Karen National Liberation Army (KNLA), the armed wing of the KNU, is still quite active in the district. The villagers in the district have had to contend with all three of these armed groups. The State Peace and Development Council (SPDC) and DKBA demand forced labour, taxes, and extortion money from the villagers while also severely restricting their movements. 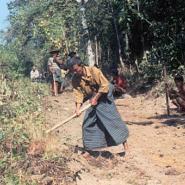 While the demands for some forms of forced labour such as portering have declined over the past few years, the villagers continue to be regularly called upon by both the SPDC and the DKBA to expand the ever-increasing network of roads throughout the district, as well to fulfil the frequent orders to supply staggering quantities of building materials. A number of new SPDC and DKBA controlled commercial ventures have also appeared in the district in recent years, to which the villagers are also forced to 'contribute' their labour. In 2000, the SPDC confiscated 5,000 acres of land for use as an immense sugarcane plantation, while more recently in late 2004, the SPDC again confiscated another 5,000 acres of the villagers' farmland, all of which is to become a huge rubber plantation, co-owned and operated by Rangoon-based company Max Myanmar. 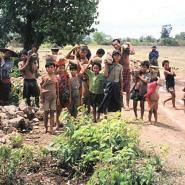 In addition, the villagers are punished for any perceived support for the KNLA or KNU. All such systems of control greatly impoverish the villagers, to the extent that now many of them struggle just to survive. Most villagers have few options but to try to live as best they can. SPDC control of the district is too tight for the villagers to live in hiding in the forest and Thailand is too far for most villagers to flee to. The villagers are forced to answer the demands of the SPDC and DKBA, of which there are many, while trying to avoid punishment for any supposed support of the resistance. They have to balance this with trying to find enough time to work in their fields and find enough food to feed their families. This report provides a detailed analysis of the human rights situation in Thaton District from 2000 to the present. It is based on 216 interviews conducted by KHRG researchers with people in SPDC-controlled villages, in hill villages, in hiding in the forest and with those who have fled to Thailand to become refugees. These interviews are supplemented by SPDC and DKBA order documents selected from the hundreds we have obtained from the area, along with field reports, maps, and photographs taken by KHRG field researchers. All of the interviews were conducted between November 1999 and November 2004. A number of field reports dated up until June 2005 have also been included. The report begins with an Introduction and Executive Summary. The detailed analysis that follows has been broken down into ten main sections. The villagers tell most of the story in the main sections through direct quotes taken from recorded interviews. The full text of the interviews and the field reports upon which this report is based are available from KHRG upon approved request. Thaton District (known as Doo Tha Htoo in Karen) encompasses what is officially the northern portion of Mon State above Moulmein and parts of Karen State to the west of the Salween River [see Map 2 of Karen State]. Nyaunglebin (Kler Lweh Htoo) District lies to the north and Papun (Mutraw) District borders the district to the northeast. The Karen National Union (KNU) originally administered five townships in the district: Kyaikto, Thaton, Bilin, Pa'an and Paung townships. Owing to the escalating State Peace and Development Council (SPDC) and Democratic Karen Buddhist Army (DKBA) influence in the region, Paung township is no longer administered by the KNU, but the other four still have a KNU presence. Much of the district is covered by the huge floodplain created by the Salween, Donthami, Yunzalin and Bilin River basins . The terrain is largely open and is dotted with flat rice fields, although some areas like Bilin township in the northeast are covered with hills and are still quite forested. Confusion often arises in that Pa'an township in the east of the district is not in Pa'an District, situated just across the Salween River , which also happens to be the seat of the Karen capital at Pa'an town. The parts of the district to the west of the Rangoon-Martaban road and railway and around the towns of Kyaikto, Bilin and Thaton are heavily controlled by the SPDC and therefore have less KNU presence than the other townships to the east. The DKBA also has a significant presence in the area, especially in Pa'an township in the east of the district. The KNU and its armed wing, the Karen National Liberation Army (KNLA), operated throughout the district and had de facto control over large parts of the district until the early 1990's. Skirmishes between the KNLA and the SPDC Army were common. During this period villagers were often shot on sight, villages were burned, and villagers were forcibly relocated. Following the creation of the DKBA in 1994, the fall of Manerplaw in 1995, and the subsequent and marked weakening of the KNU in the years that followed, the SPDC Army was able to gain control over much more of the district. However the KNLA remains active in the eastern parts of the district and are able to continue ambushing and harassing SPDC and DKBA columns. Over the past decade the SPDC and DKBA have concentrated on consolidating their control over the district by increasing militarisation, forcing villagers to move to villages under their control, and making life so difficult for the civilian population that they would be unable to engage in or support any form of resistance. The SPDC targets the civilian population in order to undermine both civilian and armed resistance. Occasional relocations of villages and burning of villages have continued to take place over the past decade, although with most villagers now living under the control of the SPDC, relocations have become scarce. The SPDC has concentrated more on placing restrictions on the villagers, demanding forced labour and arresting and torturing villagers who they suspect of helping the armed resistance. Movement restrictions and demands for fees and extortion money have so impoverished the villagers that they barely have enough to eat. The DKBA has assisted in this strategy by placing their own restrictions on the villagers, demanding forced labour, and requiring that the villagers pay a myriad of taxes. Most of the demands of all of these armed groups are channelled through appointed village heads. Some villages appoint separate people to deal with each group, so they may have a 'Burmese (SPDC) village head', a 'KNU village head', and other village elders. As village heads are the first to be punished for failing to comply with demands and often end up shouldering expenses themselves, many villages now have a system of 'one-month village heads' or even '15-day village heads' whereby the position is rotated constantly between different villagers to share the burden and the risks. 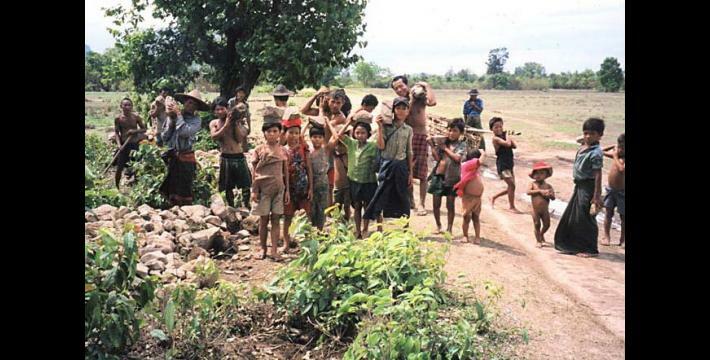 Since the KNU and the SPDC agreed an informal ceasefire in January 2004, there has been comparatively little fighting taking place between the SPDC and the KNU in Thaton District. During this time the SPDC has not actively sought out the KNLA, but rather have focused their energies more on oppressing the civilian population. While the shooting and killing of villagers has become far less common, other human rights violations such as extortion and the use of forced labour have continued unabated. Under the cover of the ceasefire, the SPDC is trying to consolidate its control over the remoter parts of the district by constructing roads and establishing new army camps. 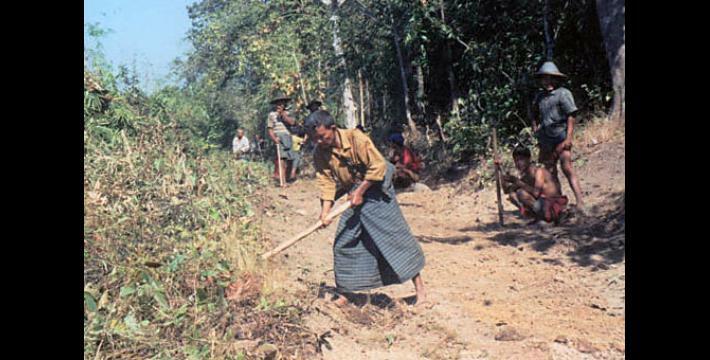 Numerous road construction projects are presently in progress across the district, and both the SPDC and the DKBA are forcing the villagers to work on various money-making ventures, the benefits of which are never seen by the villagers. The geographical location of the district makes it difficult for relief supplies or medical assistance to reach the villagers and the tight controls hanging over their heads make it difficult for them to improve their own situation. The vast extent of SPDC and DKBA control and the lack of any secure places to hide keep the number of internally displaced persons (IDPs) relatively low, compared with other Karen districts. Villagers are left with little choice but to try to live as well as they can and devise their own ways of living under the SPDC and DKBA.